Virgin Media started digging up my own and surrounding streets about six months ago, presumably as part of Project Lightning. Looks like services are now available to surrounding streets and the first half dozen or so even numbered houses in my street (it's a small street of about 50 houses total branching off into three cul-de-sacs). How would I get in touch with the local network team to find out when (if?) services will be available to the rest of the street? It just seems odd that number 2 can get services, but number 3 which is directly across the road can't. I wish I knew - VM did my parents street (dug it up - put green (or was it purple?) pipes down - covered it all up - went for a tea break one sunny day and never returned.. That was in 1997! Call the Virgin telephone number search on the web and ask when if etc. Based on past experience once a street is enabled they will flood the neigbourhood with flyers ofering "incredible" bargains if your sign up. Is there a new "box" in the street that has all the tubes going to, and also has the box been connected to the main network, educated guesses by looking at the damage to the roads and paths that was done during the installation. Very different set of events. Chances are the company that started to put that network in place went bust or ran out of cash to continue the build. VM may or may not pick it up and complete it as part of Lightning. Ducts that aren't connected to anything are known as 'orphan plant' and, depending on their condition and stage of construction, VM may use them and build the cabinets and chambers around them. Quite a bit of orphan plant could be found around here and some was reused. My street had a green cab since 2002 (Cabletel/NTL) - but they got stopped mid dig, they came back about 18 months ago and done the street. So you never know. Contractors for VM dug up the close a friend of mine lives in - Hedge End, Southampton. I assume ducts were installed, as major trench work, but then contractors left, no cables/coax installed. 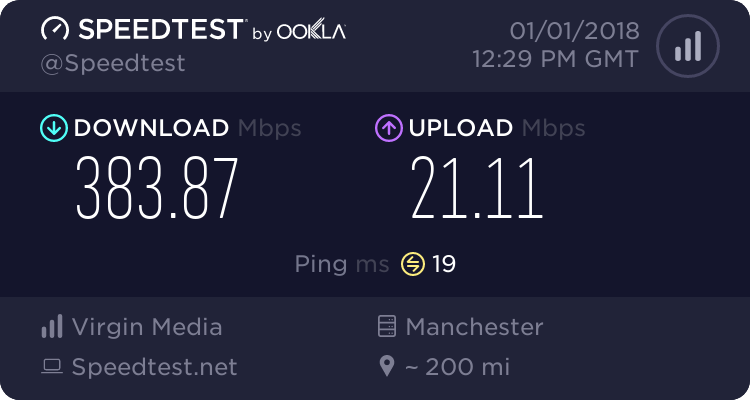 Its a small close, and the alternative is VDSL2 services maxing out at 30mbps from openreach. Very strange to spend some money and not finish off. But that's VM through and through! There is a new box in the street that was put in by Virgin a few months ago. The houses right next to it don't appear to be able to get service. That said the nearest house that can is only about 20 metres away.